Our Standard Food Moth Control Kit contains a selection of our best food moth killer products, and is designed for treating and maintaining control of a food moth infestation in a standard domestic kitchen. Provides long-lasting control for up to 12 weeks! Our Food Moth Kits contain a carefully selected combination of products from Pest Expert and Rentokil to help eradicate infestations of food product moths in kitchens or food storage areas. 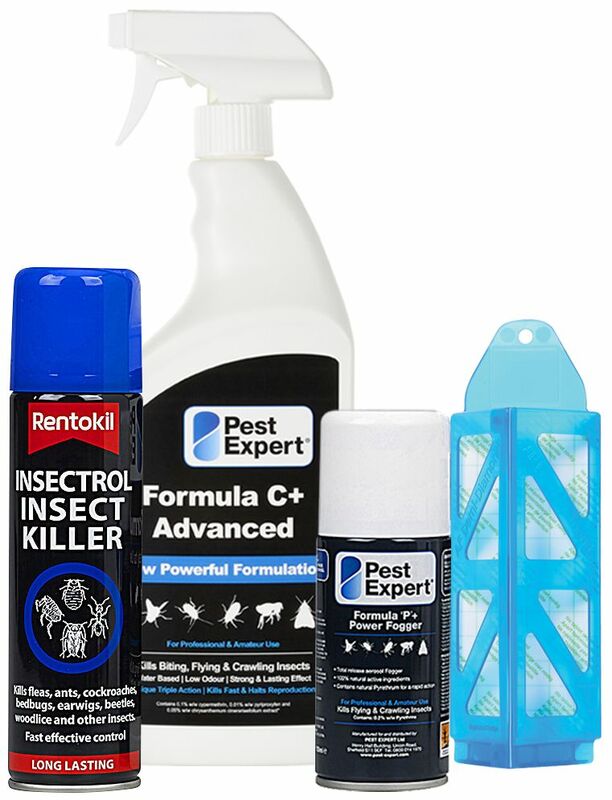 This Standard Kit contains is designed for treatment of a small domestic kitchen and, as well as containing the residual moth-killing insecticides Pest Expert Formula 'C' and Rentokil Insectrol, this Kit also contains a fumigating Formula 'P' Fogger, and a Demi Diamond Food Moth Trap. 1 x 1 litre Pest Expert Formula 'C' Food Moth Spray: Formula 'C' is a highly-effective food moth killer that offers both fast-acting and long-lasting control. As well as killing kitchen moths on contact it also leaves an insecticidal residue that continues to protect for up to 12 weeks, killing moth eggs and larvae as they go through the life cycle stages. A one litre trigger spray will cover 25 sq m and can be applied to kitchen units, food storage cupboards, walls, floor and other surfaces. 1 x Pest Expert Formula 'P' Fogger: The Fogger is a fumigating aerosol device which releases an insecticidal gas, delivering a rapid knockdown of adult moths. It does not need to be lit and so poses no fire risk. The gas leaves no visible deposits on work surfaces. One Fogger will treat one standard room. 1 x Rentokil Insectrol Spray: An insecticidal spray that kills all life cycle stages including moth eggs and larvae. 1 x Demi Diamond Moth Pheromone Trap & Holder: Ideal for aiding early detection of a moth infestation and for monitoring activity following treatment. The slow-release pheromone attracts the adult male moth, which disrupts the breeding cycle and helps reduce numbers. A pheromone pad lasts approx 8-12 weeks. All our Food Moth Kits are supplied with a professional advice sheet containing step-by-step instructions on how to use the products to carry out a successful treatment. If you’ve discovered the first signs of an infestation, then it is always best to tackle the problem as soon as possible before moth numbers can increase. If you have a food moth infestation affecting a large or commercial kitchen or food storage area then please see our Advanced Food Moth Control Kit, which offers the same products but in greater quantities. Excellent quick service. Great selection of products that work effectively! Easy to order and quick delivery. I chose the kit off the recommendation of their sales team - the products worked extremely well and the moths have gone. Used the kit to eradicate the moth problem in our pantry. The combination worked well and in less than 24 hours, the moths have gone! Highly recommended.